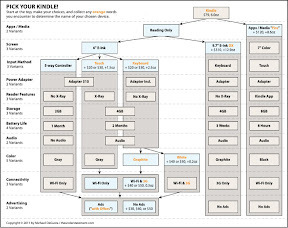 We expected an Android-powered Kindle eReader tablet from Amazon. What we didn't expect two additional model lines. To break down the 14 variations TheUnderstatement.com has posted a decision/flowchart to help you parse out the differences. 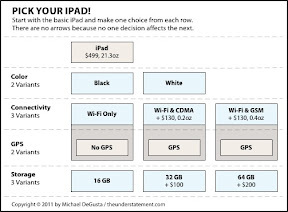 And here is a similar breakdown of the iPad 2 versions. While we can recommend picking up one of the new Kindle versions. We'd strongly suggest holding off on an iPad purchase unless you can't wait until late Spring 2012. The rumored new display on the iPad 3 would make it worth the wait.